Amanda Auchter is the founding editor of Pebble Lake Review and the author of The Glass Crib, winner of the 2010 Zone 3 Press First Book Award judged by Rigoberto Gonzlez and of the chapbook, Light Under Skin (Finishing Line Press, 2006). A former Theodore Morrison Poetry Scholar for the Bread Loaf Writers' Conference, she has received awards and honors from Bellevue Literary Review, BOMB Magazine, Crab Orchard Review, and others. 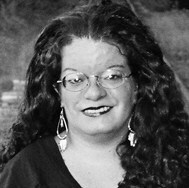 Her writing appears in American Poetry Review, Court Green, Indiana Review, The Iowa Review, Poetry Daily, and elsewhere. She holds an MFA from Bennington College and teaches creative writing at Lone Star College-CyFair. a radio croons Ain't That a Shame. fill each breath, each dry throat. On September 8, 1900 a category 4 hurricane hit Galveston, TX. Included among the estimated 6,000 dead were 90 children and 10 nuns from St. Mary's Orphanage. embedded into broken boards like buckshot. In front of shotgun houses, the bayou. weaved through umbrellas, parked cars, handkerchiefs. The yards still spoke of water. noon, your face was mine. ran you back to the ground. horn. The drum. The twirl. The debris.